Purchased from Reference Audio in 1997 formerly on the east side of Sedalia; our new location is located in the heart of Sedalia, on the corner of State Fair and Broadway. 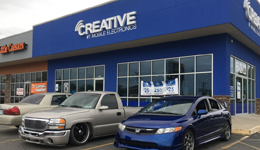 This store showcases the latest in installation tools and custom installation techniques in this beautiful 4,700 square foot facility!. Certifications - MECP Master Installation and Mobile Product Specialist.